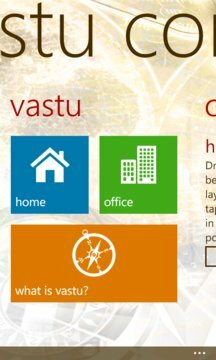 A Vastu app with ancient Vastu concepts helping you improve your home, workplace and way of living or working with peace. This app helps you to build your house or workplace according to Vastu Shastra or convert them in a place with harmonious sanctuary of peace, balance, prosperity and love. Vastu Shastra is creating a congenial settings or a place to live or work, in most scientific way taking advantages of the benefits bestowed by these five elements (Earth, Water, Air, Fire and Space) of the nature thereby paving the way for enhanced health, wealth, prosperity and happiness in an enlightened environment. Vastu Compass is application that will help you find Vastu directions and check the current Vastu of your home and workplace (office) and help you in making them Vastu compliant. 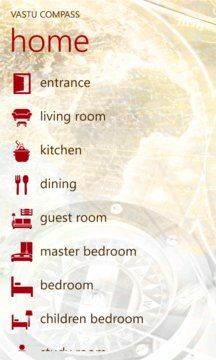 To check Vastu of your entire home add the items from list to center layout representing your home. Adjust the height and width as per layout and finally set the direction using manual compass. Now just tap on ‘check’ button. Items shown in green are at favorable positions else are in neutral position or in unfavorable position. Save layout for future reference and also share it with friends on Facebook. Send your feedback so we can continue to create better experience for you.